These books are part of my personal collection and are not for sale. However, if I should come across another copy it will be made available via the Beaded Flower Newsletter. Click here to sign up. 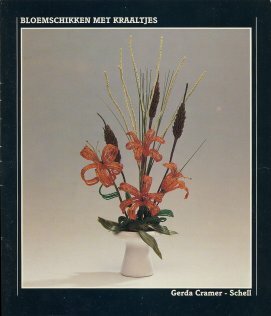 Beaded Flower Arrangements by Gerda Cramer-Schell, 1991 is a Dutch booklet approximately 8 x 7-1/4 inches and 25 pages. Instructions are included for: Blooming Rose, Exotic Orchid, Tropical Tree, Fuchsia, Chestnut Tree, and Spring Bouquet. Back Cover and inside photos. 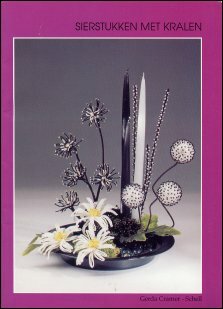 Flowers: Flower Making with several types of beads by Po-Ling Wong, 1991 is a Dutch booklet approximately 8-1/2 x 7-1/4 inches and 32 pages. Instructions are included for: Waterlily, Housepland, White flowers in full bloom, Camellia, Astilbe, Chive, Red Clover, Alpine Berries, Campanula Devils Claw, and Vuurpijlen (translates as Fire Arrows). One of my favorites in this book is the Campanula for it's unusual use of different shapes of beads. 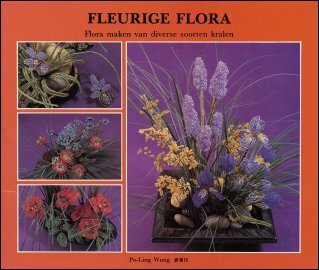 Fleurige Flora: Flower Making with several types of beads by Po-Ling Wong, 1990 is a Dutch booklet approximately 8-1/2 x 7-1/4 inches and 32 pages. Instructions are included for: Daisy, Wildflower Bouquet, Green Plant, Arrangement with orchid and tall grass, Arrangement of iris, goldenrod and lilac, Spring Greenery, Spring Bouquet, Corsages, Pearl Branches for the Bride, Bridegroom corsage (boutiennere), Flower for hat. Back Cover. 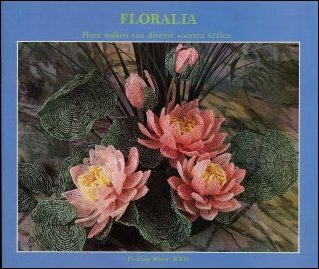 Gracious Flora by Po-Ling Wong, 1991 is a Dutch booklet approximately 8-1/2 x 7-1/4 inches and 32 pages. Instructions are included for: Peony, Orchid (Zygopetalum crinitum), Another Orchid, Bloeiende Plantenm, Bouquet of pearls, Allium, Camomile, Chrysanthemum, Red Tree, Winter arrangement. 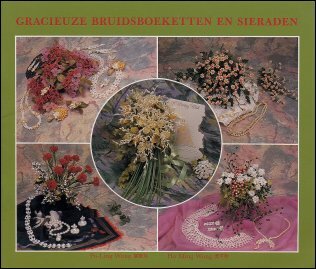 Bridal Bouquets and Jewelry by Po-Ling Wong, 1991 is a Dutch booklet approximately 8-1/2 x 7-1/4 inches and 32 pages. Instructions are included for: Romance Bouquet, Love Bouquet, Classic Bouquet, Elegant Bouquet, Bridal Jewelry, Gracieuze Bouquet. Flower Arrangements with Beads by Gerda Cramer-Schell, 1991 is a Dutch booklet approximately 7-1/4 x 8-1/2 inches and 27 pages. Instructions are included for: Rose Blossom on Driftwood, Exotic Orchid, Tropical Tree, Fuchsia, Fantasy Tree, Arrangement of Forsythia, Daffodil, Tulip, Blue Delphinium, Waterlily, Tiger Lily Arrangement. Sierstukken met Kralen by Gerda Cramer-Schell (1995) is a Dutch booklet approximately 5-7/8 x 8-1/4 inches and 24 pages. Instructions are included for: Dahlia, Spidermum, Zuiderwindlely, Elderberry Tree, Fuchsia, Viooltjes, Lilac, Snowflowers, Crocus, Daffodil. Wire and Bead Trees by Chris Van de Voorde (1994) is a Dutch booklet approximately 5-3/4 x 8-1/4inches and 26 pages. Instructions are included for: Blooming Bonsai, Blossom Tree, Blue Rain, Pluim Hortensia, Sering, Red Hawthorn, Japanese Apricot, Golden Rain. See back cover for photos of all projects. 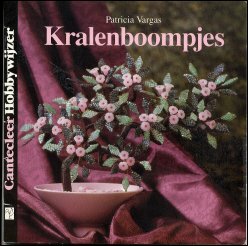 Small beaded Trees by Patricia Vargas (1990) is a Dutch booklet approximately 6-1/2 x 6-1/2 and 30 pages. 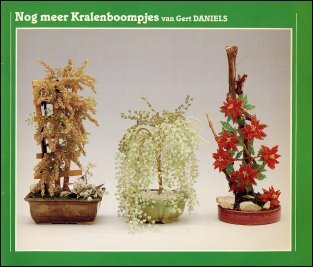 Instructions are included for: Black Bonsai, Green Bonsai, Yellow Flowering Tree, Lariks Bonsai, Herfsttoi, Palm Tree, White Weeping Willow, Flowering Palm Tree, Rose Bush, Laurel Tree, Dennetje, Spring Tree, Blue Flowering Tree, Rood Stekelbloemetje. Sierstukken Met Kralen by Gerda Cramer-Schell (1993) is a Dutch booklet approximately 6 x 8-1/4 inches and 26 pages. 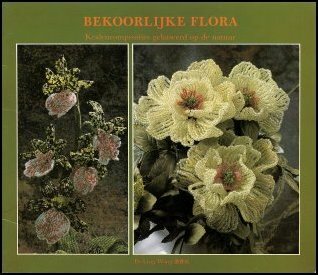 Instructions are included for: Basket of Peonies, Basket of Roses, Exotic White Narcissus, Passionflower Plant, Sfeerstuk, Berenklauw, Water Lily. 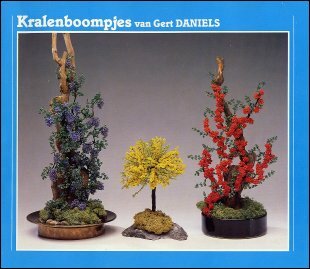 Trees from Beads by Gert Daniels (1991) is a Dutch booklet approximately 6 x 8-1/4 inches and 24 pages. 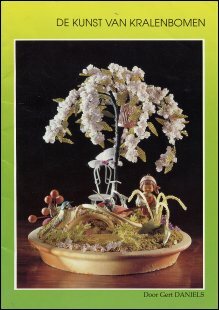 Instructions are included for: Fantasy Bonsai, Bonsai, Florida-Kelk, Seringe Tree, Hawaiin Palm, Brides Bouquet. The Art of Beaded Flowers by Gert Daniels (1991) is a Dutch booklet approximately 6 x 8-1/4 inches and 24 pages. Instructions are included for: Fantasy Magnolia, Formosa, Spring Bouquet, Fantasy Edelweiss, Orange Blossom, Lily of the Valley, Table Centerpiece. Back Cover. More Beaded Flowers by Gert Daniels (1991) is a Dutch booklet approximately 8-1/2 x 7-1/4 inches and 26 pages. Instructions are included for: Golden Rain, Kerster and Clematis, Treurwilg, Rhododendron, Wild Chestnut, Biedermeyer Brides Bouquet. 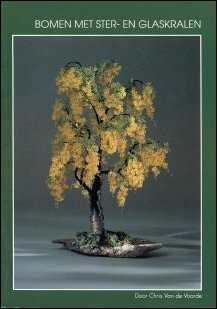 Beaded Trees by Gert Daniels (1989) is a Dutch booklet approximately 8-1/2 x 7-1/4 inches and 26 pages. 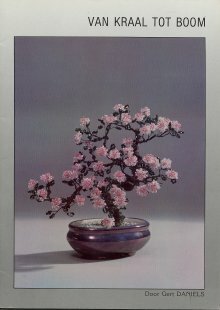 Instructions are included for: Spring blooming tree, Mimosa, Small Tree with Pink Blossoms, Bonsai, Fire Thorn, Druivelaar. 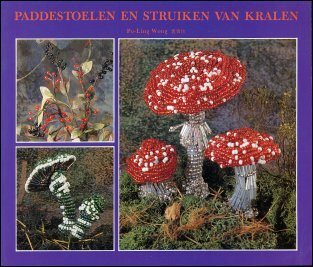 Paddestoelen en Struiken van Kralen Mushrooms and Shrubs from Beads by Po-Ling Wong (1991) is a Dutch booklet approximately 8-1/2 x 7-1/4 inches and 32 pages. Instructions are included for several different types of mushrooms and bushes. Beads for the Windowsill by Janske Francken, 1997 is a Dutch booklet approximately 5-3/4 x 8-1/4 inches and 30 pages. Instructions are included for: Passionflower, Fuchsia, Stephanotis, Roses, Calla Lily, Ixia, Hydrangea, Red Tree, Table Centerpiece.